July update : new characters and load/save screen ! I did a little context where you can name one of the characters of the game : the coroner. People suggested really cool names, but Morty was “the one”. This name has been elected with almost half of the votes. So here he is, Morty and his dark humor will help Waffles during his adventures. The demo is quite short and can be played in less than 30 minutes. Saved games were not mandatory, but now that the game gets bigger and bigger, I have to implement a load/save system. It’s done, and here it’s what it looks like. 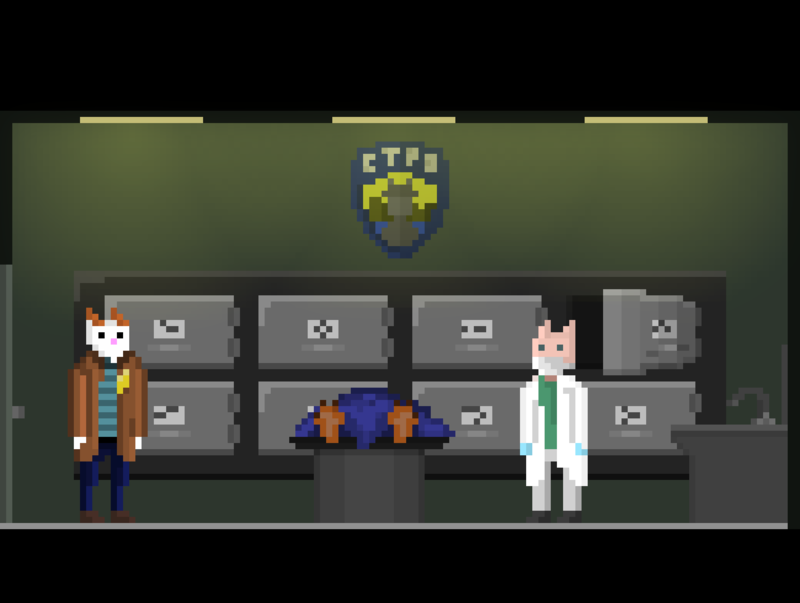 Spotty, a sniffer cop (and the first dog who appears in the game) and Howard, a detective racoon (from Backbone game). I will only do a cameo, it’s a little tribute for my friends at Eggnut. It’s also another scene from the police station, where Waffles will meet Spotty for the very first time.